I love Dropbox hacks and promote the Dropbox free account with all my heart to my readers. As a Dropbox user you might know that Dropbox syncs everything under the main ‘My Dropbox’ folder in your computer. If you wanted to sync a folder outside of Dropbox folder, you had to jump through hoops to get it. While not too hard to do, this one is pretty simple to use. 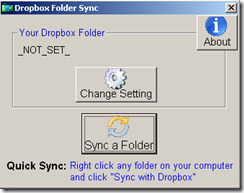 Dropbox Folder Sync is a tiny windows app that lets you easily right click on any folder and add it to Dropbox sync. All you have to do is just run the app, specify where your Dropbox folder is. Now all you need to do just find the folder on your hard drive to sync to your Dropbox account. It basically creates a symlink. You can also right-click on any folder and select ‘Sync with Dropbox’. Note: You may want to be aware that this utility moves the original folder to Dropbox and creates a symbolic link for the folder. It also asks for a confirmation if the folder is already out there. Note 2: The symlinks may not appear immediately if you are moving huge folders to Dropbox. They will appear once the folder is moved. A new version (2.5) of Dropbox Folder Sync is released with unsync feature, automatic dropbox path detection and several other fixes.